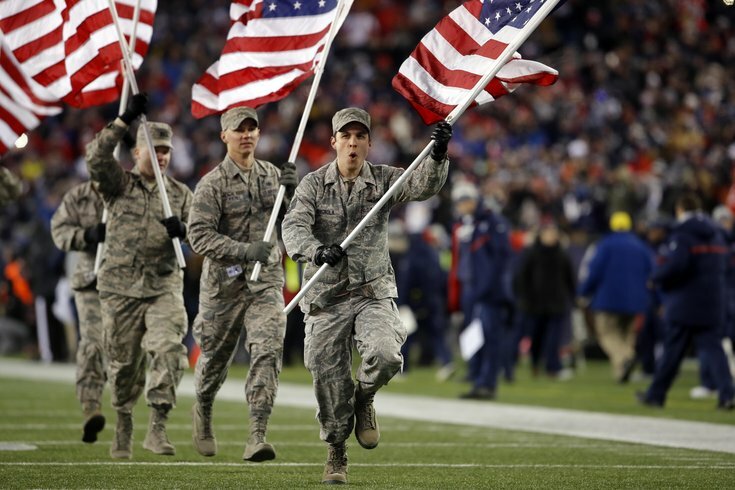 Members of the military run American flags onto the field prior to the AFC Divisional playoff game between the New England Patriots and the Tennessee Titans at Gillette Stadium Jan .13, 2018. As the government shutdown enters its second day, one unexpected consequence of the stalemate arose for deployed U.S. military: not being able to watch the NFL Conference Championship games. In light of the government shut down, Eagles fans deployed overseas would have been kept from watching the team's first NFC appearance in a decade, as the government shutdown meant the entire Armed Forces Network (AFN), which offers radio and television programming for military audiences, is also shut down. Though CNN noted Saturday that AFN, which airs throughout 168 countries and in Navy ships, would be suspended until Congress and President Trump came to an agreement, an update from NFL spokesperson Brian McCarthy promises troops around the world will now be able to watch the games. Before Sunday morning, McCarthy said the games would only be streaming at USO Centers with NFL Game Pass for free -- an issue for troops in locations including Iraq and Afghanistan, where Internet streaming capabilities are limited. Previous to this most recent update, Dana White, a chief Pentagon spokesperson, told CNN that "sports broadcasts are not considered an essential activity," thus calling for the suspension of the AFN. In light of the highly anticipated games and growing backlash, however, watching options were restored, though details on how exactly that came to pass were not shared. Yahoo! Sports pointed out that during the 2013 government shutdown, AFN services remained intact.